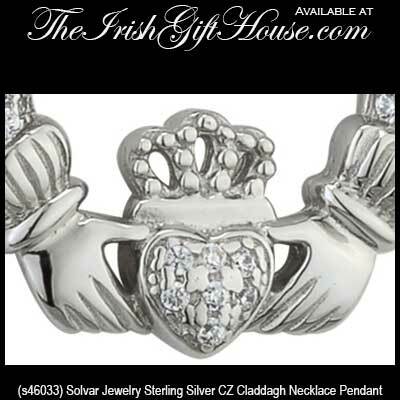 Sterling silver Claddagh necklace features CZ stones in the heart and from cuff to cuff. 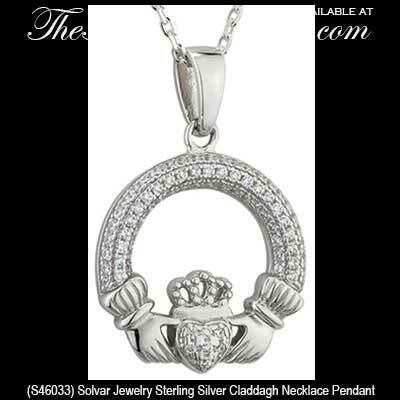 This sterling silver Claddagh necklace features CZ stones in the heart along with two rows that are set from cuff to cuff across the top of the pendant. 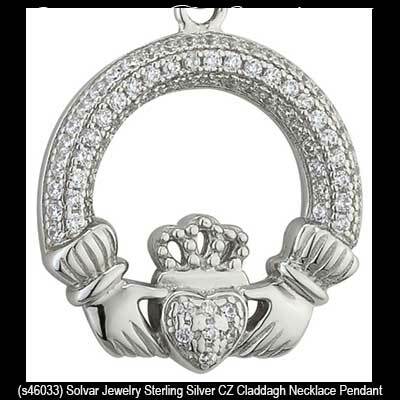 The heavy Claddagh pendant measures 5/8" wide x 3/4" tall, including the jump ring and the chain bail, and includes an 18" long sterling silver chain. The Fáilte Collection from Solvar features a heaver assortment of jewelry. Sterling silver Claddagh earrings are a drop style that are enhanced with CZ studded hearts.